At that moment, she realized it. Something unusual was happening around her. An unusual increase of demand for chocolates. Sweets... all the sweets have been gloriously discounted more than usual! "A mature woman should enjoy such things with modesty and reserve. But, to be blunt, I can't overlook this opportunity!" The Tiger forgets about calories and dives into the battlefield. 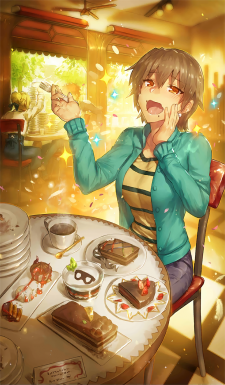 "Ah... Conquering my greatest sweet tooth." This page was last modified on 7 February 2019, at 06:45.